Legends fans also aren't trying to "take away" the new universe; all most of us are trying to do is have the Legends storyline co-exist with Canon and have all the stories that weren't finished continued; Ben Skywalker, Vestara Khai, Jaden Korr and the Sith Clones, Allana Solo, etc. Huh, what is with the site today? I was wondering how JediGeekGirl managed to accidentally triple post, seeing two separate people doing it means there's probably a bug of some sort causing it? He wasn't upset about it? This quote says otherwise. I realize he has tried to say nice things about the new series, but let's face it, that's just him being political; there are plenty of quotes which show he's pretty upset about the way things have been handled, and really, who can blame him? He was backstabbed and now has to watch his legacy treated in a disrespectful manner. Are you suggesting Lord of the Rings isn't a major cultural phenomenon? I don't consider myself a major fan of the series, but it's lasted a lot longer than Star Wars has, and on top of that, it set the template for these sort of things. Before Lord of the Rings, the idea of an author creating a nuance, intricate, detailed fictional world for their story was completely foreign. Lord of the Rings did it first. And while I'm pretty casual as a LotR fan, I'd at least have enough respect for it that if something happened like, say, someone trying to say Shadows of Mordor replaces the original canon and is now "duh tru cannon", I'd feel sympathy for those who are major fans of the series. I wouldn't be greedy and throw them under the bus just because I found Shadows of Mordor to be a fun game.Beyond that, I find it ironic you call me selfish when you're the one that's made it quite clear you really don't care who Disney hurts. You keep going on about "fans like you", but I'm sorry: You're not a fan; if you weren't a fan of Star Wars until two movies came out that contradict the original movies, you aren't a fan of Star Wars to begin with. Seriously, you consider Rogue One to be worth more than all six of the main Lucas canon films combined? You'd really take that one and throw out those six films? Without those six films, you wouldn't have your beloved fanfiction to begin with. The father of LEGENDS isn't Lucas.....sorry to bust your bubble. You sir have NO right to say that I am not a fan. I live and breathe it and to say otherwise because I am not a bitter Legends fan or swimming in the legends timeline is just disrespectful. And in your mind, who, exactly, is more responsible for Star Wars than Lucas? Who is it that you see as being more important to the original canon than him? And you are ignoring my entire post to cherrypick a few words and ignore the actual context... You're trolling at this point. I said you're not a fan because you yourself admitted to not caring about the subject. You yourself admitted that you really don't care who gets hurt or why. You yourself admitted that you don't give one care about respect, and calling you out on such is not disrespectful. You're essentially doing a more linguistically advanced form of "I know you are but what am I? ", and you've been avoiding my points again and again. And in your mind, who, exactly, is more responsible for Star Wars than Lucas? Who is it that you see as being more important to the original canon than him?And you are ignoring my entire post to cherrypick a few words and ignore the actual context... You're trolling at this point. I said you're not a fan because you yourself admitted to not caring about the subject. You yourself admitted that you really don't care who gets hurt or why. You yourself admitted that you don't give one care about respect, and calling you out on such is not disrespectful. You're essentially doing a more linguistically advanced form of "I know you are but what am I? ", and you've been avoiding my points again and again. I said the father of LEGENDS, not the father of Star Wars. They are two different people. I said I don't care about legends being that, they are just stories that are still there to read and play with. The way you are acting it's like someone killed one of your kids. Get over it. I have connections with legends my self, not like some but enough where there is/was a strong connection and you don't see me hating the new stuff. I LOVE THE NEW STUFF and at the end of the day, you can not take that from me. Enjoy your bitterness sir. Me? I'm riding high on my fandom. Zahn is considered to be the Father of Legends with Lucas being the Father of Star Wars. Okay, you're officially pulling my leg at this point. A New Hope (originally simply called "Star Wars") came out long before Heir to the Empire, and was the start of what is now considered "Legends" by Disney fanatics... But you already know this. Goodbye troll, I have no more time to waste on you. Okay, you're officially pulling my leg at this point. A New Hope (originally simply called "Star Wars") came out long before Heir to the Empire, and was the start of what is now considered Legends... But you already know this. Goodbye troll, I have no more time to waste on you. A New Hope is still canon sunshine. Zahn didn't even author the first EU book but the success of Heir in 1991 launched the golden age of the EU by proving to Lucasfilm the people still cared about Star Wars. Hence he is the father of the EU, now labeled Legends. A New Hope is Lucas canon, not Disney canon. And yes, I'm aware Zahn wasn't the first one to write a Lucas canon novel. You're the one who called him the father of the original canon, not me. You're welcome to think he was the mind behind A New Hope, but that's your delusion to deal with, not mine. As the father of legends repeatly says, a man you look up to for creating a trilogy you hold high and helped to launch a universe you hold dear. "There is Canon and legends, no EU, No New/Disney Canon, No original canon. Just Canon and legends"
Jaxxon may be coming to canon sooner then you think. Ps. 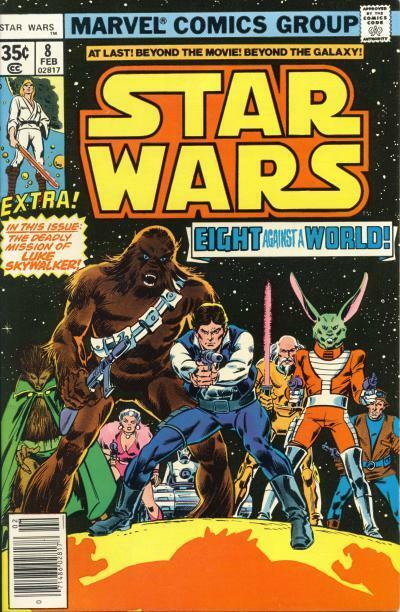 Can we get a Jaxxon card please? What Drugs are you on? A New Hope is 100% part of the Official Disney Canon. Fact. Legends is the official label given by Disney Lucasfilm to what used to be know as the Expanded Universe. Fact. A New Hope is not considered Legends material by Disney Lucasfilm. Fact. The fact that Zahn is widely considered to be the Father of the EU not Star Wars itself is pretty widely accepted and I'm not sure why you are arguing except to be obstinate at this point. Actually, the early Marvel comics were not intended to be canon, though later some elements of them were introduced to canon- much like how cyborg Maul wasn't originally intended to be canon, but then was later worked into such. The first official piece of the EU was Star Wars: From the Adventures of Luke Skywalker, a novelization of the original film which predated its release by about half a year (note the "Legends" tag at the top of the article)... And if you don't want to count that since it is a novelizaton of the movie, then there's Splinter of the Mind's Eye which is often considered the birth of the EU. A New Hope is Lucas canon. It directly contradicts Disney canon with entirely different versions of the characters they share. It'd be one thing if Disney tried to make their movies connect to the originals and made it seem like they were using them as a starting point, but it's pretty clear from The Force Awakens that it has no story line connection to the original films.